An international, multilingual hosting firm with offices in Canada, the US, the UK, Australia, and Germany, HostPapa provides shared, VPS, and reseller hosting. Their single shared hosting plan includes a number of unlimited features in addition to the easy-to-use cPanel control panel and the “1-click” Softaculous applications installer. However, we take issue with a few of the less-than-consumer-friendly aspects of their pricing disclosure policies as well as certain practices utilized during the checkout process. Further, testing demonstrated excellent reliability, but slow server speeds. HostPapa has earned 4 stars and the NCM Online designation of RECOMMENDED WITH RESERVATIONS. Known for their extensive international presence, HostPapa is a popular low-cost host headquartered in Ontario, Canada. The company is committed to the concept of green web hosting and supports a number of worthy causes that benefit the environment. In addition to VPS and reseller hosting, HostPapa offers a single, well-equipped shared hosting plan. Unlimited features include: disk space, bandwidth, websites, domains, MySQL 5.1 databases, e-mail autoresponders, e-mail forwarding, and e-mail addresses. Best-practices features include the easy-to-use cPanel control panel, the Softaculous applications installer, and numerous open source tool and apps (WordPress, b2evolution, Joomla, Drupal, phpBB, SMF, MyBB, PHP-Fusion, Concrete5, image gallery applications, and more). E-commerce solutions include OpenCart, PrestaShop, AbanteCart, osCommerce, Zen Cart, and more. Additional shared hosting plan highlights include free domain registration (first year only), a free website builder; HostPapa Connect e-mail marketing software, free migration from your existing host; the CloudFlare content delivery network; 24/7/365 multi-lingual e-mail, chat, and phone support; a 99.9% uptime guarantee; and a 30-day money-back guarantee. Additional-cost options include a dedicated IP address ($3.00 per month), SSL certificate ($19.99 per year), SiteLock (from $14.95 per year), and automated website backups (from $2.99 per month). Click the ‘Pricing and Features’ tab below for a complete list of HostPapa shared hosting features. 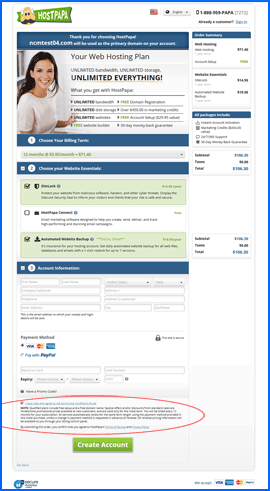 Screenshot of HostPapa sign-up page. We have circled the fine print in red. Click to enlarge. HostPapa utilizes a fairly simple — but not quite consumer-friendly — two-step sign-up process. In the first step you enter the domain name you wish to associate with the account. Should you wish to take advantage of the free domain name, note that it is only free for the first year. A .com domain renews at $14.99 annually. What bothers us most about this practice is not that there are no asterisks adjacent to the pricing — although that is troubling — what we take greatest issue with is that we are being told that the renewal rates will be available through our billing control panel. In other words, we’ll tell you what our hosting really costs, after you buy it. Although the page does not make any reference to it, a phone call to Sales revealed that the HostPapa website does include a renewal rates page. It is accessible via a link that reads “regular rates” within the fine print near the bottom of the home page. It would be no big deal to create a pop-up with renewal rates accessible from the shopping cart, but it would seem they prefer to surprise you. To prevent you from being surprised, we’ve added the pricing immediately below. Screenshot of HostPapa cPanel control panel. Click to enlarge. Another aspect of the sign-up process with which we take issue is the fact that two added-cost options (SiteLock and Automated Website Backup),are preselected and have already been added to the shopping cart. While you are free to deselect them, we believe this to be a poor and perhaps even deceptive business practice. SiteLock does renew at the same rate, but Automated Website Backup (listed at $19.95 per year) renews at a cost of $35.88 to $249.95 per year depending on the amount of disk space used. Once inside the shopping cart, you might also notice that “I have read and agree to the terms and conditions of use” has already been checked. This is yet another dubious practice to add to the list. On a more positive note, the shopping cart does present you with a total amount due for the current billing term, prior to submitting your payment. NCM Online has and will continue to point out any less-than-transparent business practices employed by the web hosting companies we review — wherever and whenever we encounter them. Further we have and will continue to deduct from the ease-of-use and satisfaction ratings of any host that utilizes such practices. HostPapa’s scores have been adjusted downward accordingly. As is our practice, we selected the lowest-cost shared hosting plan for review and testing purposes. We completed our purchase using the PayPal payment option. The “SignUp” e-mail and PayPal receipt arrived almost instantaneously. However, the “Welcome” e-mail with the information required to set up our test site took more than eight hours to arrive, leading us to believe that new accounts are processed and/or reviewed manually. The e-mail did include a direct link to our account dashboard, our client ID and password, FTP information and login, as well as support contact details. While it did not contain nameserver information, it did include a link to the “New Clients” page which lists the nameservers and provides useful information for new customers. HostPapa Uptime Test Results Chart. Click to enlarge. Next, we proceeded to upload our NCM test site using the newbie-friendly cPanel control (screenshot above right). An industry best practice, all HostPapa shared accounts utilize cPanel and the Softaculous “1-click” applications installer. Softaculous allows for quick and easy installations of content management systems (like WordPress), e-commerce software, as well as a wide range of website tools and applications. After uploading our test site, we set up the Dotcom Monitor speed and uptime testing, and waited for the test results to accumulate. All web hosting services reviewed by NCM Online are purchased and subjected to our 10-day test for reliability and speed. HostPapa testing began on 11/27/14 and concluded on 12/06/14. 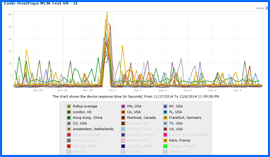 We are pleased to report that Dotcom Monitor testing resulted in a 100% reliability score. See uptime test results chart above right. HostPapa Speed Test Results Chart. Click to enlarge. Although reliable, our shared plan proved to be something less than fast. HostPapa scored a sub-standard, 10-day average speed of 2.1602 seconds to load our simple, one-page test site from 13 locations worldwide, and a glacial 1.8172 seconds from 7 U.S. locations. Note that faster speeds have been recorded by hosts with less than 100% uptime. See screenshot right for test locations and results chart. Despite a number of excellent features and a 100% reliability rating, a number of dubious policies coupled with below average speed test results preclude our unqualified endorsement at this time. HostPapa has earned 4 stars and is recommended with reservations by NCM Online. Cheap website hosting company price comparisons based on 1-year term list price before coupon/promo codes or limited time/introductory offer discounts. These are the renewal rates for the second year of hosting. To ensure that you receive the most affordable HostPapa pricing possible, please see Summary above for coupon code and/or current discounts before making any purchases. HostPapa is a privately held company with offices in Ontario, Canada; Niagara Falls, NY; Frankfurt, Germany; and London, UK. The company believes that every customer is a family member and has adopted the motto: “Let Papa take care of you.” The company knows that client websites are important and that customers must be able to rely on their hosting company to provide uninterrupted service. It has created affordable hosting solutions for businesses in the small-to-medium range that are dependable, user friendly, and geared towards customer service. The company’s web hosting packages offer high-powered servers and professional service to assist individuals and businesses in getting their websites live on the Internet. Customers can obtain these services at only fraction of the prices demanded by many competing technology hosting companies. In addition, HostPapa offers its clients cloud services and solutions to help them increase productivity and save cash. The company knows that the cloud is a powerful new business tool, and it’s proud to offer the finest cloud services and support available. HostPapa’s list of available services includes: hosting for websites; small business pack, mobile and reseller web hosting; online stores; website backup; registration of domain names; Google Apps support; CLoudFlare, SiteLock Security Seals; SSL certificates; and the company’s own email marketing solution – HostPapa Connect. HostPapa provides high performance website hosting. The firm’s top quality hosting infrastructure is at the core of its service offerings and it features Intel Server equipment and a complete Cisco-powered network. HostPapa customers can look forward to a straightforward and solid web-hosting business that supplies highly adept tools for web administration, the leading available set of features, committed customer service, top-quality equipment, highest guaranteed uptime, and dependable and secure backups. HostPapa provides the industry standard of 99.9% server uptime and continues to strive for perfection. The goal is 100% uptime — but that is a difficult to reach in the context of shared hosting because many subscribers share the same resources. The company maintains a proactive stance in regard to its equipment and has applications, controls and monitoring systems in place to rapidly identify potential problems. 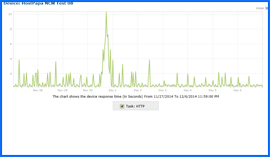 HostPapa recognizes that power supply is a critically important to web hosting. Its data center is second to none in terms of electrical power support. The data facility has two new transformers that provide the reliable main power supply. These are powered directly through the local substation. The building also contains diesel generators for backup power in the event that the energy grids experience a power failure. The company also utilizes comprehensive controls for temperature and climate, fire-suppression systems, water detection systems, physical security, and raised floors in the facilities, so that hosted websites can remain up and running. Company data centers are provided with every imaginable safeguard to secure the premises and equipment. Facility access is highly controlled. Sites are patrolled each day by uniformed security. Building main entrances also are equipped with optical turnstiles that afford security back-up. Closed circuit television (CCTV) cameras have been placed in sensitive areas inside buildings. These cameras monitor every part of the building, including tenant and mechanical areas and loading docks. Monitoring of buildings also includes alarm systems, access controls such as card readers, alarm management, recording of data, and comprehensive reporting capabilities, as well as a photo identification system. The company values all of its customers and is committed to providing outstanding service, no matter which service packages clients choose. HostPapa is not satisfied until its customers are. This video tutorial demonstrates the installation of WordPress on a HostPapa shared hosting account using cPanel and the Softaculous applications installer.